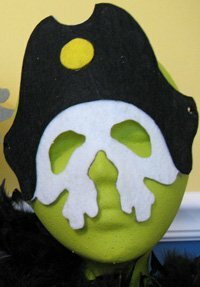 Here are a few quick Halloween Masks for you to put together and create your own costume! The first one is FREE! When finished it will look like the one on the left. 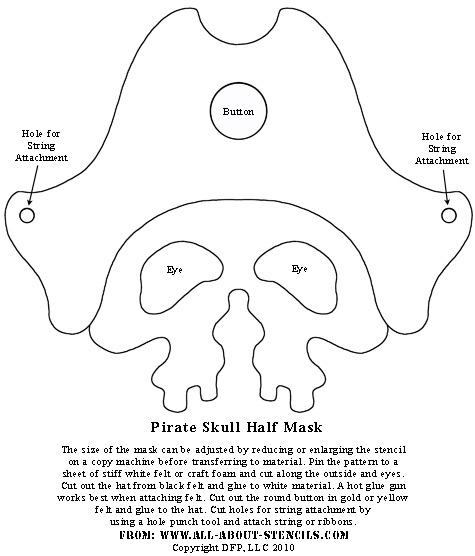 It’s a Pirate Skull Mask Pattern from our free stencils collection (it’s part of a Halloween Crafts and Stencils Book that will be released soon). 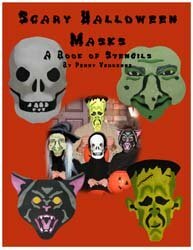 Below is a fun book using stencils to create some scary masks. This is only one of the many books that you can find in our Stencils Catalog. Each book will come to you as a downloadable pdf file in your e-mail. Just check your e-mail after purchase for the link to connect to your file and print or save. It's that easy! This purchase is of a down-loadable PDF file with 32 pages. All designs can be adjusted to fit. Instructions are included. Check your e-mail after purchase for the link to connect to your file and print or save. It's that easy! 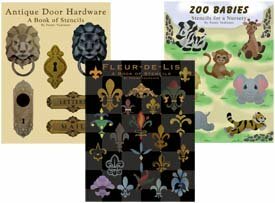 If you'd rather get your Stencil Pattern Books in Print (like these or the one pictured above) then visit our Printer's Book Shop for a large variety of stencil collections. These books are easy to follow and come with complete instructions. You'll find all of the stencil designs used as examples throughout this site. Aren’t printable Halloween Masks great. Just like printable stencils they can get you going on that project or idea now. You don’t have to get in the car and go shopping or wait for something to come in the mail. And hey! Don’t forget that I (and everyone else) want to see what you have done with your Stenciling Art. Just click on Contact Me to get your masterpiece showcased here on this web site. Won’t that be exciting! Or if you have any questions or want to share information join in on the Stencil Blog. Well, I hope to hear from you soon. Return to Home Page from Halloween Masks. Return to Halloween Crafts from Halloween Masks.